In an earlier piece, I presented a five step plan to win the argument on climate change, and dealt with step 1, finding a simple way to tell the story. Remember, I ended on the importance of offering a positive message and not leaving everyone feeling hopeless. Let’s take off from there. Just for the record, though, here are the five steps. Over $1 trillion dollars has been invested in clean energy technologies. The cost of solar panels has decreased 80% since 2008. Tesla sales are already outpacing other luxury cars in California, and news about charging infrastructure is great. Bike share programs in the US have doubled just this year. These and many other technologies are just the foundation. The larger opportunity comes from building on this foundation because it is a better way of doing things, not just a low-carbon life but a better life. Imagine a future of practically unlimited energy harnessed efficiently from the power of the sun, wind and tides. Imagine a future where this energy is stored personally instead of delivered to you, untethering you from power outlets, cables and adapters, increasing freedom and mobility. Imagine a future where you can travel from coast to coast in mere hours, and the technology to get you there produces more energy than it uses. Imagine a future where driverless vehicles communicate to maximize roadway capacity and fuel efficiency, so you are free to happily text your way to work without being stopped by the police. Imagine a future where electric cars charge through inductive power transfer so you never have to stop to get fuel. Imagine a future where intelligent buildings are capable of producing all the energy they need, learning how to best use that energy to maximize your comfort and reduce your costs. I think the argument can be broadened still further, and systematised. The entry point I use is the model of ‘climate compatible development’ Tom Mitchell and I developed for the Climate and Development Knowledge Network (which I chair). Here is the diagrammatic version (and find the Policy Brief from 2010 here). 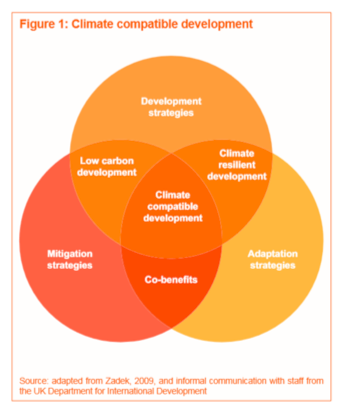 It shows that climate compatible development takes place when three things come together: mitigation, adaptation and development. This is important, because it reminds us that action on climate change cannot be at the expense of poverty eradication, human development and other aspects of ‘good change’. What the diagram does not quite do is capture the extent of transformational change driven either by climate change itself or the action taken to tackle climate change. We discussed that extensively in the Policy Brief, but the point does not feature properly in the diagram. That’s why I now re-label the top circle as transformation. Everything else remains unchanged. The change is really important, though. Transformation is the great undiscussed topic in the developing country climate world. There are then four key steps in the argument, four ways to create a positive message, four drivers of change. Avoiding disasters . . .
First, adaptation is the obvious driver of change in many poor countries. Disasters are costly, in human life and money, and they concentrate the minds of politicians and policy-makers: see cases in El Salvador, Bangladesh, Pakistan, and now the Philippines, or track the pronouncements of the Climate Vulnerability Forum. Of course, not all disasters are climate-related, so an important feature of adaptation planning is that it should be integrated into wider national risk assessment and disaster preparedness strategies. Countries don’t need two Disaster Risk Management (DRM) Strategies, one dealing with climate adaptation and one with everything else. They need one plan, one set of institutions, and one budget. Also, not all adaptation is about DRM, unless the field is drawn so widely as to include research on crop varieties, the design of infrastructure and buildings, and long term investments in health systems. These also need to be part of integrated climate compatible development plans. Finding new sources of growth through mitigation of carbon pollution . . .
Second, the idea of mitigation is also fairly straightforward, in the sense that projection of Business As Usual for most countries will have them running into C02 constraints sooner rather than later – see the Colombia example in the previous piece. If Angel Gurria, the Secretary-General of OECD, has his way, and the 2050 target becomes zero net emissions, then there will be no escape from mitigation in any corner of the world. The OECD has a workstream on the topic, including a book published in June 2013 on Putting Green growth at the Heart of Development. As with adaptation, it is important to have an integrated approach, one plan not two. I’ve made the point before, in a piece called ‘ten propositions on climate change and growth’ that ‘green growth’ is a special case of ‘growth’: there is no point in trying to stimulate green growth if the incentive and regulatory framework is inimical to growth of any kind. It’s always worth checking the World Economic Forum’s Global Competitiveness Index, or the World Bank’s Doing Business Report. For the record, Colombia, since that has been a case study, does pretty well on the first, comparable to Mexico, a bit behind Brazil but ahead of Argentina; and well on the second, ahead of Mexico and a long way ahead of the other two. ● All exporters are affected by the rising cost of transport or the changing relative prices of transport types. So export-oriented growth strategies may not be as attractive or may require changing. Island economies that are dependent on tourism, for example, may be affected negatively by rising air transport prices. The same is true for export-led agricultural strategies, like flowers or horticulture, which also face uncertainty over temperature changes and the volume and distribution of rainfall. ● Some developing country producers may benefit from exploiting demand for biofuels or the opportunities presented by carbon market incentives to conserve forests. Conversely, countries with a traditional economic reliance on exporting high carbon fuel sources, such as oil and coal, may be disrupted by a shift in demand to cleaner fuels. A good way to think about this is in terms of ‘disruptive innovation’ or ‘creative destruction’. Sometimes, the effects are negative. This is not a case associated with climate change, but, for example, David Landes describes in The Wealth and Poverty of Nations how the indigo industry in India was decimated by the development of chemical substitutes in Europe: production in 1895-96 was 187,000 tons, in 1913-14 only 11,000 tons. A current example, induced by policy rather than technical change, is the hand-stitching of footballs in Sialkot in Pakistan, decimated by FIFA regulations on the roundness of balls. The latest rules specify that balls may only deviate from a perfect sphere by 1.3%. Sialkot was the world centre for stitching of balls, but hand-stitching cannot meet the new specification: the Times reports that employment has fallen in a decade from 100,000 to only 10,000. (If you want another example, read a brilliant history of the shipping container, The Box, by Marc Levinson – according to the Economist, a bigger driver of globalisation than all the trade agreements of the past fifty years put together). Sometimes the impact of disruptive innovation can be positive (for some). China now exports nearly $US 30bn a year worth of solar panels to Europe, despite the fact that installed solar capacity in China has been small. This is a case of China identifying and pursuing a market niche, to the point that there have been allegations of dumping and a need for dispute resolution. Similarly, as noted in the ccd Policy Brief, the transformative potential of Bolivia’s lithium reserves is highly significant for the future industrialisation of the country. Bolivia may hold up to 70% of the world’s reserves, making it the ‘Saudi Arabia of lithium’. And, by the way, both the China and Bolivia examples are quite unrelated to mitigation or adaption in those countries. Positive or negative, the point is that no country can afford to ignore the disruptive effects of climate change on tradeable sectors. To my mind, this puts industrial policy very firmly in the spotlight, and calls for active measures to minimise the development costs and maximise the development benefits. Some countries have followed this path. South Korea, for example, established a Presidential Commission on Green Growth as early as 2008, followed by a national strategy and a five year plan. Key sectors included renewable energy, cities, water and 27 core, green technologies. This was President Lee Myung-bak betting the family silver on green growth as Korea’s future path to prosperity – although I read that the policy has been downgraded by the new Government. Denmark is another case, with very ambitious climate targets and a new climate plan, outlining 78 different ways that the transport, agriculture, building and waste sectors can cut their emissions and contribute to reaching the target. In the developing world, some have seen real potential in this space: Rwanda was an early leader, for example. Exploiting synergies and co-benefits . . . Finally, and this helps with the politics, there can be significant co-benefits. The various editions of UNEP’s Emissions Gap report contain many examples, often when the primary driver of the policy was the co-benefit rather than concern for the climate: phasing out coal-fired power stations to improve air quality (Toronto); rapid bus transit systems to reduce traffic congestion and speed the journey to work (Bogota); or investing in renewables to increase energy security (Japan). In China, concern for the local environment looks like being a powerful driver of action on climate change. And making all this seem exciting and urgent! Avoiding disasters . . . finding new sources of inclusive growth . . . seizing the opportunities of transformation . . . exploiting synergies and co-benefits. Also helping others. Also saving the planet. Also being a responsible global citizen. We will come soon to the costs and benefits, winners and losers, of these new policies, but the point for now is that it seems to me there is enough material there to forge a positive message, attractive to different personality types and to those with differing moral ‘taste-buds’ (see the previous piece). Tackling climate change is not (just) a grim duty, required for long-term sustainability of the human race. Can it not be the path to a more inventive, more socially inclusive and even happier world?